These "Alternative Spring Breakers" spent their vacation week volunteering. April 7-13 is National Volunteer Week, when volunteers nationwide are acknowledged for their service-oriented contributions. 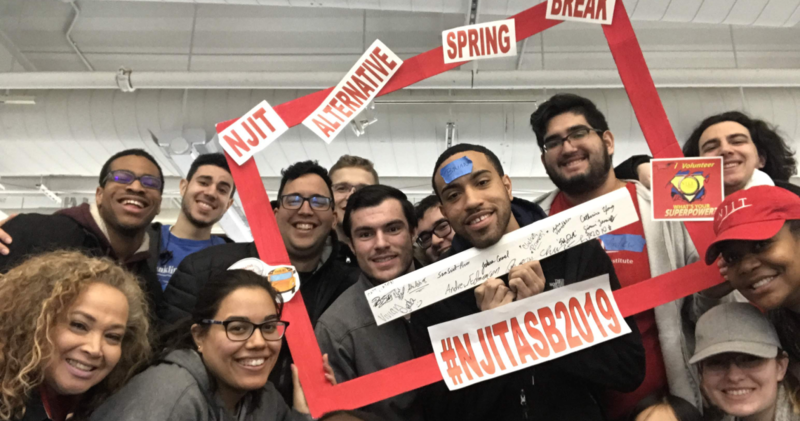 The NJIT community remains engaged in a range of giving-back activities, centrally coordinated by Career Development Services. At the heart of the university’s community-minded success are the students, who this past year continued to raise money, tutor and mentor public-school children, spend their spring break building and repairing homes, and much more. (Two photos above) NJIT students helped install livestock fencing at OASIS tlc, which operates a farm for young adults with autism to learn animal care, horticulture and other vocations. (Two photos above) Through the SBP home repair project, student volunteers cut baseboards and tiled a bathroom as part of the reconstruction of a Keansburg family’s home that was affected by Superstorm Sandy. (Two photos above) Habitat for Humanity Newark had NJIT students painting baseboards, caulking windows and hanging a door at a home in Jersey City.